The Beavis laboratory has a focus on developing novel immune-based therapies for Cancer. We employ innovative approaches and technologies to enhance the effectiveness of both conventional immunotherapies and chimeric antigen receptor (CAR) T cells in the treatment of solid cancers such as breast cancer and melanoma. Immunotherapy of cancer has been a major breakthrough in the last decade, now being accepted as the fourth pillar of cancer treatment after surgery, chemotherapy and radiotherapy. Immunotherapy is most effective in cancers with a high mutational burden, while cancers with a low mutational burden are refractory. Our research focus is to identify novel targets/ combination approaches that are effective in these refractory cancers. ATP released by dying cells can activate the immune system via the stimulation of P2X7 receptors on dendritic cells leading to the production of IL-1β and IL-18. These pro-inflammatory cytokines stimulate anti-tumour immunity through the activation of multiple immune cells (right hand side). ATP can be converted to immunosuppressive adenosine via the intermediates ADP and AMP by CD39 and CD73. Adenosine consequently suppresses anti-tumor immunity through the activation of adenosine receptors on multiple immune cells including T cells, NK cells and Antigen Presenting Cells (left hand side). Tumours utilise multiple immunosuppressive pathways to suppress anti-tumour immune responses including well characterised immune checkpoints such as the PDL-1: PD-1 axis. One such mechanism is the production of adenosine by tumour cells and host immunosuppressive cells (Beavis et al. 2012), catalysed by the ectoenzyme CD73 (Figure 1). Our work has shown that expression of CD73 is a prognostic biomarker in cancer patients and has highlighted the significant role of adenosine in the tumour-mediated immunosuppression of NK cells (Beavis et al. 2013) and T cells (Beavis et.al. 2015). Adenosine suppresses the anti-tumour activity of NK cells and T cells principally through binding to adenosine A2A receptors, expressed following activation of these cells. Importantly, we led the way in revealing that blockade of A2A receptors can enhance anti-tumour T cell responses and increase the effectiveness of PD-1 blockade (Beavis et al. 2015). Following these findings, several pharmaceutical companies have now developed antibodies and/or small molecule inhibitors of the CD73-A2A axis and these are now in phase I clinical trials, including two phase I clinical trials that are being conducted at the Peter MacCallum Cancer Centre (https://clinicaltrials.gov/ct2/show/NCT02655822- in collaboration with Prof. Sherene Loi (Breast cancer oncologist). Current work in this area is focused upon further characterising the mechanism by which A2A antagonists are effective at both the cellular and molecular level (Figure 2). We believe this will result in the identification of novel combination therapies, with the potential to further enhance the effectiveness of targeting this pathway in cancer patients. In the Beavis laboratory, we are focused upon enhancing the effectiveness of CAR T cells in solid cancers where results have so far failed to recapitulate the successes seen in haematological cancers. The main reasons for the lack of CAR T cell efficacy in solid tumours include a) Poor trafficking of CAR T cells to the tumour site b) Heterogeneity of tumour antigen expression in solid tumours, meaning that many tumour cells are not recognized by CAR T cells and c) Local immunosuppression of CAR T cells. Our laboratory is developing novel CAR T cell technology and combination therapies that can address each of these current shortfalls. For example, we have shown that combination with an immune costimulatory antibody anti-41BB or A2A antagonists can enhance the effectiveness of CAR T cells, in part through engagement of the host immune response (Mardiana et al. 2017, Beavis et al. 2017). Current research efforts are focused upon addressing each of the hurdles to CAR T cell efficacy in solid tumours using technologies such as CRISPR-Cas9, shRNA, inducible expression- and standard overexpression vectors. These technologies allow for the modification of gene expression by CAR T cells and consequently modulation of the tumour microenvironment to one more permissive for CAR T cell activity. One of the major limitations of currently approved immunotherapies is that they are ineffective in patients where an immune cell infiltrate into the tumour is lacking (so called ‘cold’ tumours). 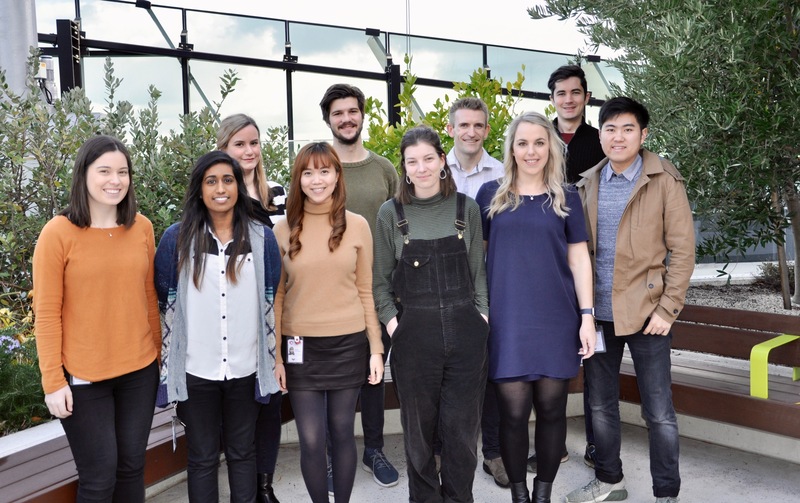 In the Beavis lab we are currently developing novel treatment strategies designed to enhance immune cell trafficking into tumours and testing them in combination with immunotherapies such as anti-PD-1 and anti-41BB. For example, we have previously shown that MEK inhibition can enhance the immunogenicity of tumour cells and promote the infiltration of T cells into the tumour (Dushyanthen et al. 2017). We are currently investigating new ways in which to modulate the expression of chemokines that govern the trafficking of both endogenous immune cells and CAR T cells to solid tumours. This project has the potential to discover novel targets that could significantly enhance the effectiveness of immunotherapy in solid cancers. Beavis PA, Henderson MA, Giuffrida L, Mills JK, Sek K, Cross RS, Davenport AJ, John LB, Mardiana S, Slaney CY, Johnstone RW, Trapani JA, Stagg J, Loi S, Kats L, Gyorki D, Kershaw MH, Darcy PK (2017) Targeting the adenosine 2A receptor enhances chimeric antigen receptor T cell efficacy. J Clin Invest. 127(3):929-941. This publication showed that targeting the A2AR could enhance CAR T cell function in solid tumours. Mardiana S, John LB, Henderson MA, Slaney CY, von Scheidt B, Giuffrida L, Davenport AJ, Trapani JA, Neeson PJ, Loi S, Haynes NM, Kershaw MH, Beavis PA* Darcy PK*. (2017) A Multifunctional Role for Adjuvant Anti-4-1BB Therapy in Augmenting Antitumor Response by Chimeric Antigen Receptor T Cells. Cancer Res. 77(6):1296-1309. *Co-senior authors. This study showed that anti-41BB could enhance CAR T cell function by engaging the endogenous immune response. Dushyanthen S, Teo ZL, Caramia F, Savas P, Mintoff CP, Virassamy B, Henderson MA, Luen SJ, Mansour M, Kershaw MH, Trapani JA, Neeson PJ, Salgado R, McArthur GA, Balko JM, Beavis PA*, Darcy PK*, Loi S*. (2017) Agonist immunotherapy restores T cell function following MEK inhibition improving efficacy in breast cancer. Nat Commun. 8(1):606. *Co-senior authors. This study highlights the relationship between RAS-MAPK-MEK siganalling and the reduced immunogenicity of tumour cells leading to reduced immune cell infiltrate. A combination of a MEK inhibitor and immune agonist therapy was shown to enhance anti-tumour immune responses. Beavis PA, Milenkovski N, Henderson MA, John LB, Allard B, Loi S, Kershaw MH, Stagg J, Darcy PK. (2015) Adenosine Receptor 2A Blockade Increases the Efficacy of Anti-PD-1 through Enhanced Antitumor T-cell Responses. Cancer Immunol Res. 3(5):506-517. This highly cited publication showed that A2AR blockade could enhance the therapeutic efficacy of anti-PD-1. Subsequently, this combination therapy has progressed to clinical trials at multiple sites including the Peter MacCallum Cancer Centre. Beavis PA, Divisekera U, Paget C, Chow MT, John LB, Devaud C, Dwyer K, Stagg J, Smyth MJ, Darcy PK. (2013) Blockade of A2A receptors potently suppresses the metastasis of CD73+ tumors. Proc. Natl Acad Sci USA 110(36):14711-6. This highly cited publication showed that A2AR and A2BR blockade could reduce tumour metastasis. Beavis PA, Stagg J, Darcy PK, Smyth MJ. (2012) CD73: a potent suppressor of antitumor immune responses. Trends Immunol 33(5):231-7. This review covers the immunosuppressive CD73-adenosine axis and its relevance to cancer.